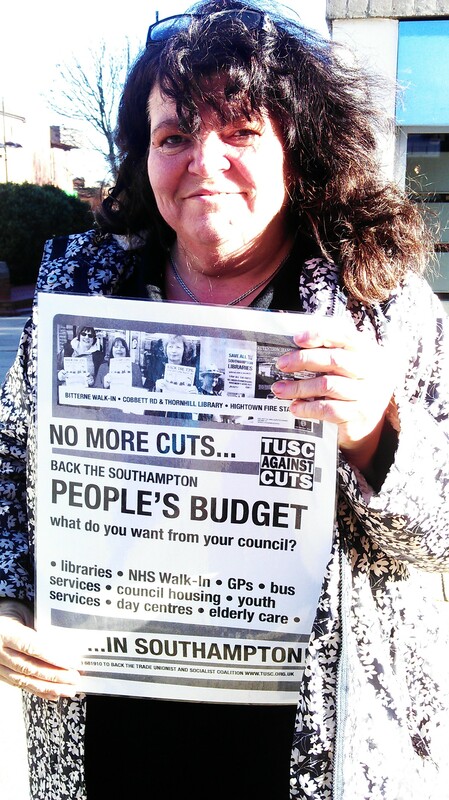 Southampton TUSC | Anti-cuts campaigners across Southampton calling on Southampton Labour council to use its cash reserves and borrowing powers to set a legal, balanced, NO CUTS budget in 2016. Fighting to restore government funding to Southampton City Council to provide all services the city needs! NO MORE CUTS! LABOUR MUST FIGHT! 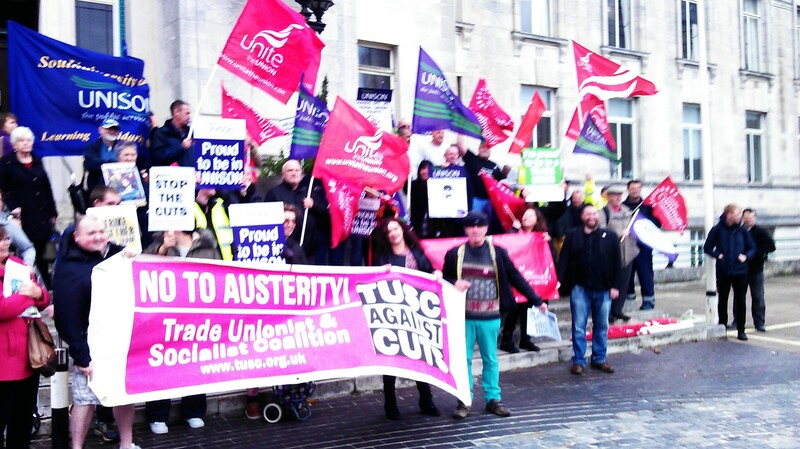 On Saturday 9 January Southampton TUSC (Trade Unionist and Socialist Coalition) held a public meeting to support a council budget that meets the genuine needs of the people who live and work in the city. Before the meeting residents chatted over tea and coffee and had photos taken of them holding signs with messages they had written telling the council what they would like them to do for the people. Sue Atkins, TUSC, chaired the meeting and explained that throughout December we had been out on the streets asking local people what they would like from the Labour council and encouraging them to complete our budget consultation forms. Sue then invited the audience to have their say on how they feel about local issues. Topics ranged from cuts to elderly social care provision, the local housing crisis, child poverty in the city, to the closure of five of the city’s libraries. Sean Hoyle, the new RMT transport union president, promised solidarity from the TUSC affiliated union over backing the ‘people’s budget’. He also said establishment politicians are there to convince 51% of the population that they can have whatever they like in life as the other 49% will pay for it! Southampton councillor Keith Morrell (who rebelled from Labour over cuts) also spoke. He talked about how people want accountability and a principled stand from their representatives on the local council – instead of doing whatever the government tells them to do. People don’t expect betrayal from those that they voted into a position on the council. Keith said Southampton Labour council and other councils around the country should stand together and demand that the government return the funding stolen from us. The Labour Party, including its councillors, should get behind Jeremy Corbyn’s, anti-austerity call, on which he was decisively elected Labour leader. We should demand that Labour candidates support the People’s Budget. But, Keith doesn’t believe that this will happen and Labour could lose in May’s local elections. The consequence will be a Tory council in charge of our city. Nick Chaffey, TUSC, closed the meeting saying that the council should utilise its reserves as a temporary tactic to protect our services. He said TUSC is 100% behind councils opposing the cuts and will stand with Labour councillors that oppose them, but we will not support those who accept them. The meeting agreed to call a demonstration against the cuts on Saturday 6 February, 12noon outside West Quay, Southampton and to lobby the council on Wednesday 10 February, 1.15pm, Civic Centre, Southampton. The Trade Unionist & Socialist Coalition (TUSC) is an electoral alliance involving the RMT transport union, the Socialist Party, other socialist group and leading members of trade unions. Is it illegal for councils to use reserves and borrowing powers to defend jobs and services? No! To win, Labour councils must fight! On February 10, Southampton Labour Council is set to vote through another massive round of cuts to council jobs and services. Is it true that councils have ‘no option’ but to pass on Tory cuts? Below we reprint the legal, balanced, NO CUTS budget of Southampton anti-cuts councillors Keith Morrell and Don Thomas presented to the council budget meeting in February 2013. This showed clearly that councils can use reserves and borrowing powers, to set legal, balanced, NO CUTS budgets as a means to build a fightback to restore government funding to provide the services Southampton urgently needs. If Southampton Labour council were to take similar steps now, set a budget that met the needs of the city and demand the government funds the shortfall, they would receive enormous support for such a stand and set a fighting example for other councils to follow. If you agree, come and hear more at the Southampton People’s Budget event this Saturday 9 January, 2pm in the Meon Suite, James Matthews Building, Guildhall Square, Above Bar Street, Southampton. Working class people all over the country are facing vicious cuts in council services. Labour councils are generally responding by wringing their hands and making the cuts anyway. But in Southampton two councillors, Don Thomas and Keith Morrell have refused to do this and have made an important stand against the cuts. They have been expelled from the Labour Party as a result. On 13 February they put an alternative budget to the council, which the council tried to gag. But as the reports below explain a protest before and lively interventions in the council meeting made sure the cuts budget was exposed and an alternative posed. The fight against the cuts goes on! Is it true that councils really have ‘no option’ but to pass on the Con-Dems’ cuts? That’s the argument being made by Labour councillors as they meet to set their 2013-14 budgets. A core policy of TUSC is that when faced with government cuts to their funding, councils should refuse to implement them. It argues that the best way for councils to mobilise the mass campaign that is necessary to roll back Con-Dem austerity would be for them to set budgets that meet the needs of their local community and demand that the government makes up the shortfall, like Liverpool council successfully did in 1984. But to save jobs and services now while building such a campaign, TUSC would support councils using their reserves and prudential borrowing powers to avoid passing on the Con-Dem cuts. But is even this ‘buying time’ strategy possible? What about local government legislation that commits councillors to setting a ‘balanced budget’? Wouldn’t council officers step in and set the budget themselves? All these questions have come up in the anti-cuts struggle in Southampton. When TUSC’s policy was first raised by Socialist Party members in official consultation meetings late last year Labour councillors baldly dismissed it as ‘not possible’. But it began to win support from council workers and service users. And when the ‘rebel two’ councillors Keith Morrell and Don Thomas submitted a draft budget amendment to increase Southampton’s ‘unsupported borrowing’ by £22 million, council officers were forced to respond. The rebel councillors’ proposals met the legal requirements of a balanced budget at least for the 2013-14 financial year – it was not a ‘deficit budget’. But the council’s chief financial officer (CFO) would not endorse it as a ‘prudent budget capable of implementation’. He argued, for example, that Southampton was not in a sufficiently ‘dire financial position’ to successfully apply for a ‘capitalisation direction’ (government supported borrowing to fund day-to-day ‘revenue spending’), one of the alternative budget proposals. Consequently council officers advised the Mayor – an elected Labour councillor – to make a chair’s ruling that the amendment would not be debated at the council’s budget-making meeting and that’s what he did. But it could have been debated. The myth of the all-powerful officers was shown to be just that – it was councillors who closed off the debate. Even the legal guidance all the Southampton councillors received – and this is standard everywhere – made it clear they had the power to “determine whether they agree with the CFO’s statutory report issued under section 26 of the Local Government Act 2003”. That means, of course, that if there are genuinely different assessments that could be made, councillors can make them. Before the meeting Keith and Don wrote to every Labour councillor asking them to use the legal power they had to at least allow their amendment to be debated. “Isn’t it for elected councillors to judge whether the crisis for public services in the city is ‘sufficiently dire’ for the steps we propose to be taken?” Keith and Don asked. Evidently not, as the Labour councillors backed the Labour Mayor’s ruling. Nothing can hide this lesson of Southampton. Councillors have a choice. There are alternatives to implementing the cuts. And Labour councillors chose not to take them. “[Keith Morrell said:] ‘The trade unions were instrumental in getting Labour elected and I think there’s a lot of disappointment among their members that Labour isn’t delivering. ‘Labour promised to protect jobs and to protect services and obviously they’re not. ‘There’re a lot of union members who are angry, frustrated and probably unsure where to go – they put their faith in Labour. 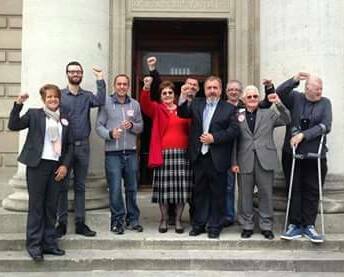 Since this was written in 2013, Keith and Don have both been re-elected with large majorities in the Coxford ward in Southampton and continue to stand firm in their opposition to cuts. To re-open Oaklands Pool by restoring the funding (£235K) discontinued at the July council meeting. In addition, to provision a capital outlay of £1.5m to ensure a 15-year lifespan for the restored facility. To reverse the proposal for a 2% increase in council tax for 2013-14 in favour of a council tax freeze, and to consequently accept the government’s Council Tax freeze grant (at a net negative cost to the General Fund for 2013-14 of £0.470m). To reverse the proposals to abolish the Older Persons council tax discount and the discount for Special Constables, at a cost to the General Fund for 2013-14 of £1m. To prudentially increase General Fund Unsupported Borrowing during the 2013-14 financial year by £22m – following an officers review of all General Fund expenditure and assets which could be properly supported by the capital programme or a capitalisation direction applied for – with the revenue funding to support such borrowing to be drawn from the Organisational Development Reserve. To instruct the cabinet to bring forward proposals to develop the Stand Up For Southampton campaign, in collaboration with other local authorities, to persuade the government to reverse the cuts in central government funding for Southampton and other local councils and provide relief funding for those authorities that have had to deplete their reserves or adopt other temporary budget-balancing measures to maintain vital public services. We are writing to you about the forthcoming budget debate at the 13 February Council meeting. 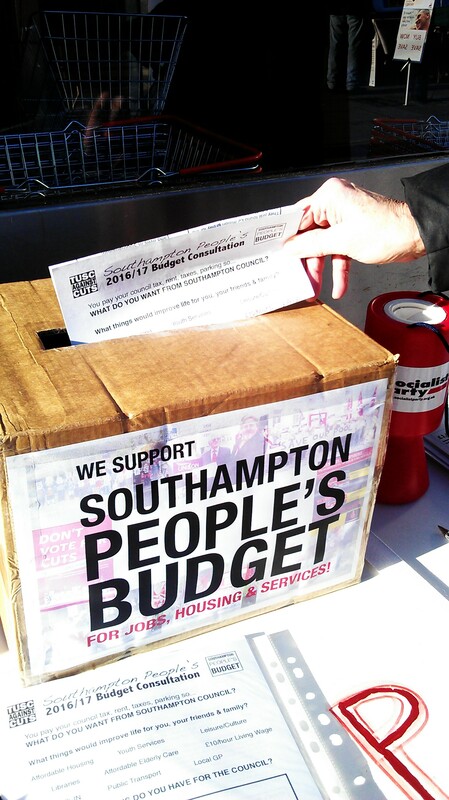 As a minority group on Southampton council we properly submitted an amendment to the Executive’s proposed budget. While our amendment meets the requirements of a balanced budget for the 2013-14 financial year – it is not a ‘deficit budget’ – the Chief Financial Officer (CFO), under his budget monitoring authority, has not been able to endorse it as a ‘prudent budget capable of implementation’ if it were to be agreed by the full council. In consequence we understand that the Director of Corporate Services, in his role of Monitoring Officer, has decided to recommend to you, the Mayor, to make a chair’s ruling that, while the amendment will be printed and distributed to members at the 13 February meeting, it should not be published on the council website or debated at the meeting. We are not writing to ask you to support our budget amendment, although we believe that it reflects the election promises to protect council services made by Labour candidates. But we are appealing to you – as democratically elected councillors with the ultimate say on what can and cannot be debated on 13 February – to at least allow our amendment to be discussed as part of the usual budget-making process. The main point of controversy over our budget amendment is the proposal to increase General Fund Unsupported Borrowing during the 2013-14 financial year by £22m, following an officers’ review of all General Fund expenditure and assets which could be properly supported by the capital programme or a capitalisation direction applied for. We see this measure – which would generate sufficient resources to avoid cuts and increased service charges for this year – as a means to ‘buy time’ for the campaign necessary to reverse the cuts in central government funding for Southampton and, indeed, for local government generally. Our starting point when drafting our amendment was best summarised in the commentary on the Prudential Code – which guides council borrowing – by Richard Harbord, a member of the working group that compiled the Code, who greeted the new borrowing regime inaugurated by the 2003 Local Government Act as a “move to integrate the whole financial planning process” [Understanding the Prudential Code, Seamus Ward, ACCA, 2004]. “This is the first time capital programmes, revenue budgets and Treasury investment strategy has been integrated”, he argued, giving councils greater financial flexibility and freedom to borrow, and we believe that our proposal is in accord with that principle. It is true – and this is a point of contention – that our budget amendment does not specify the items of current and projected General Fund expenditure which involve a capital element which could be properly supported by the capital programme through prudential borrowing (without needing government permission). Or alternatively, any other elements of General Fund expenditure for which a ‘capitalisation direction’ (government permission to capitalise revenue expenditure) could be sought over the next 12 months. But that is why we are calling in our amendment for an officers’ review of General Fund expenditure, not being able, of course, as minority group councillors, to instigate the thorough examination needed except through such means. The CFO, having cautioned members about “significant shortfalls in future years” even in his initial statutory statement on the Executive’s draft budget [paragraph 63, General Fund Revenue Budget, 20 November 2012], not unnaturally does not judge this course of action to be prudential or sustainable over the medium term. In addition, while he has confirmed with the Department of Communities and Local Government (DCLG) that there will be a Capitalisation Directions programme for 2013-14, he believes that Southampton is not in a sufficiently dire financial position for any applications it makes to be successful, at least in whole if not in part. Consequently he is arguing that, even if the council were to adopt our amendment, it would not be ‘capable of implementation’. These judgements, of course, must be taken into account by councillors when they come to vote on budget-making decisions. But they are nonetheless judgements and having regard to them in their budget deliberations is not the end of a councillor’s role. They too must assess the arguments and make a judgement – and they can only do so in this case if the budget amendment is allowed to be presented to the full council. The final budget document that councillors received makes it clear how they should assess the CFO’s advice on budget decisions: “Members have a duty to determine whether they agree with the CFO’s statutory report issued under section 26 of the LGA 2003” [paragraph 130, General Fund Revenue Budget, 5 February 2013]. That means, of course, that if there are genuinely different assessments that could be made, councillors can make them. So why shouldn’t they be able to subject our amendment to the same test as the Executive’s proposals? The budget document guidance also stresses that the decisions councillors make are “effectively preliminary decisions”, “setting the framework” for the budget period but with “specific proposals” requiring “further implementation decisions” [paragraph 142]. It further notes that it will be “for Council to determine how to meet any budget gap that may arise as a result of such implementation decisions” [paragraph 144]. All budget proposals then, require an assessment as to whether they would be ‘capable of implementation’. So why not ours? But this can only be done, of course, if the amendment is presented in the usual way. Lastly, there is the question to consider of judgements and political assessments. Any CFO’s assessment must inevitably include an element of political judgement. That is only right but it is also right for councillors to make their own judgement. We face a different situation to that facing councils, for example, in the early 1990s. But it’s worth asking how many CFOs (then more usually known as borough treasurers) in November 1990 began drawing up budget proposals for 1991-92 confidently predicting that, just four months later, the Community Charges (General Reduction) Act would have gone through parliament, cutting the last poll tax bills by £140 and increasing government support for local authorities by £4.3 billion (nearly £7 billion in today’s money)? Isn’t it for elected councillors to decide whether the crisis facing public services in the city is ‘sufficiently dire’ for the steps we propose to be taken? In conclusion, we are more than happy to further discuss the issues raised by our budget amendment beyond those dealt with here. But we do appeal to you to use your power as an elected councillor to allow our amendment to be properly tabled, even if you cannot subsequently bring yourself to vote for it when a full and fair debate has been concluded.